During an operating session yesterday, I continued to test the Sergent Engineering couplers. Recently, Mike McNamara has been blogging about his experiences with boosting the weight in the freight cars on his HO scale Maine Central Railroad to well beyond NMRA specifications. As Mike writes on his blog, he is now setting his 50-foot cars at 8oz – about double the 4.5oz recommendation per NMRA RP20.1. When drilling cars in a yard, the cars don’t bounce around and jerk all over the place. There is a naturally-occurring inertia battle between the locomotive and the heavy freight cars. The switching shove and pull moves smooth out, and occur more naturally. To put it in perspective, a typical 10-car cut in a yard may weigh 7 lbs or more! The amazing thing is how nice the heavier cars feel when you handle them and put them on the track. It makes the other cars seem super light, even at NMRA standards. It just feels like a working railroad piece now and less like a model. Switching a few cars is really cool and feels totally different. Hard to put into words, but the extra weight really changes the dynamics of car handling. Reading this, I wonder if the extra weight – and the changes in the dynamics of car handling – would provide enough inertia to encourage the steel locking ball inside the couplers to drop when cars connect. Right now, it seems, coupling onto a single car at a prototypically slow speed can actually push the car along without the locking ball dropping into place. Since many of the moves during an operating session on my layout involve single cars, that’s a problem. So, adding extra weight is worth a try – but I must keep in mind that unlike Mike and Mike, who run diesels on their layouts, my small steam power already struggles with hauling two passenger cars equipped with compensated trucks. In particular, the 10-wheelers will slip their drivers – and my experiments with Bullfrog Snot were not successful. I don’t want to overweight my rolling stock to the point that my locomotives can’t pull a typical train. As well, locomotives must be able to shove a cut of cars up the short but steep incline of the Port Rowan coal track. And weighting empty open cars like hoppers and gondolas could be tricky. Fortunately, I have a couple of open cars I can simply set weights in to see if it makes a difference. This entry was posted in Couplers, equipment by Trevor. Bookmark the permalink. You realise that you’re doing practical testing for some of us with your Sergent couplers? 😉 I have been reading this with much interest, as I do like their appearance. I’ve spent more than a quarter century looking at couplers on a daily basis. Now I try not to break them! But theories on car weighting are many in the hobby. Some actually advocate cars weighing LESS than NMRA spec. 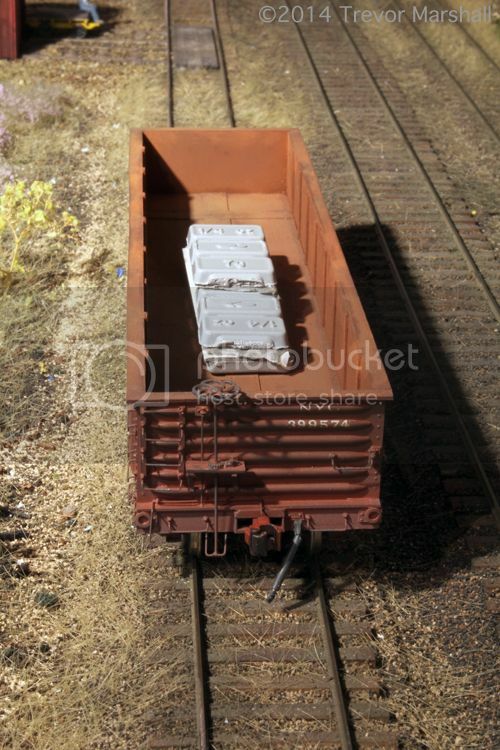 The key for model trainhandling seems to be to keep all cars of a uniform weight. I don’t know if I care for overweighting cars, as this may result in consequential quick wear to bearing surfaces in the trucks. Solved one problem and created another? I can vouch for the real thing having issues with making couplings even with both knuckles open. Sometimes a “pin” (lock block in the jaw of the coupler head) doesn’t drop, or drop fully into place behind the knuckle. So we separate the cars, then “hit it again” to jar the pin closed. Sometimes we have to repeat this. Fortunately not too often. Will Sergent couplers wear in time to couple on first attempt? The answer may lie in noting which couplers are opened and closed most, and noting their performance relative to those less operated. Perhaps the one on the tender of the loco? Uniform weight is less of an issue if you weight your cars heavier than the NMRA recommendation. I’m doing the same experiments, again from Mike Confalone’s comments. It’s nice to hear Mike McNamara agree. I run HO steam and small diesels on my glorified switching layout with up to 2% grades. I’m converting to Sergents on my home rolling stock and Kadee 153’s (“scale”, short shank, whisker) for those to be used in interchange on our club layout. Will keep you in the loop, and will be posting my results on the Model Rail Radio Facebook page. The main problem I have with Sergent couplers is somtimes the knuckle won’t open, so I give it a little rap with the uncoupling tool and that usually makes it work, I’ve never worried about correct weight in my cars as I have a lot of open cars like Tichy pulpwood cars and a lot of gondolas I usually use metal trucks for weight & maybe lead in the centersill but no operational problems, I can’t stand seeing open cars weighted correctly with 1/4 ounce weights sticking out everywhere. I agree, Dale: Open cars need concealed weights (and I shot the lead photo for this post with weights piled in a open car to illustrate the issue). I suspect the weight issue – how much, etc. – is largely dependent on the layout. I’ll experiment,, but won’t offer an opinion on what works – merely report on what works for me. I recommend everybody conduct their own experiments on issues such as this. On the topic of the locomotives, how much weight are in them? I have a friend who routinely casts extra weight for his steamers – in the boiler, cab, firebox – and the extra weight helps improve tractive effort. They are not weighted to the point that the drivers can’t slip, but much more than “stock”. His HO scale locos end up at about a pound or more, not including the tender. Good question. They’re brass, so there’s a bit of weight already. They have weights, where they can be fit. Even in S, these are small locomotives and they’re quite tightly packed as the photo in my post on swapping the decoders in my two 10-wheelers might suggest. In addition to what you see in the photo there, there’s a speaker that rests under the decoder in the smokebox. If you add weight, be sure to watch the axle pockets on your trucks, especially if you have pointed axles. We had a guy at the club one time who really liked to weigh cars down. The friction managed to eat through a set of Kadee metal trucks. Interesting observation. I have always preferred to add some mass to models, with a noticeable benefit to running. In a discussion with a very experienced modelling friend (who used to work in the medical instruments industry, on the mechanical design side of things) two or three years ago, we discussed the issue of pin-point bearings, and he was of the opinion that they made things too free running, and really needed careful adjustment to get optimal running. The conclusion of this was that maybe thin (1mm) parallel axle ends and simple “top-hat” bearings wouldn’t be such a bad idea. Anyone who has had the luck to see the P4 Irish layout Adavoyle in operation can vouch for this approach: the running was impeccable.